Copyright � 2009 Charlesworth et al; licensee BioMed Central Ltd. This is an open access article distributed under the terms of the Creative Commons Attribution License (http://creativecommons.org/licenses/by/2.0), which permits unrestricted use, distribution, and reproduction in any medium, provided the original work is properly cited. Gene identification using linkage, association, or genome-wide expression is often underpowered. We propose that formal combination of information from multiple gene-identification approaches may lead to the identification of novel loci that are missed when only one form of information is available. Firstly, we analyze the Genetic Analysis Workshop 16 Framingham Heart Study Problem 2 genome-wide association data for HDL-cholesterol using a "gene-centric" approach. Then we formally combine the association test results with genome-wide transcriptional profiling data for high-density lipoprotein cholesterol (HDL-C), from the San Antonio Family Heart Study, using a Z-transform test (Stouffer's method). We identified 39 genes by the joint test at a conservative 1% false-discovery rate, including 9 from the significant gene-based association test and 23 whose expression was significantly correlated with HDL-C. Seven genes identified as significant in the joint test were not independently identified by either the association or expression tests. This combined approach has increased power and leads to the direct nomination of novel candidate genes likely to be involved in the determination of HDL-C levels. 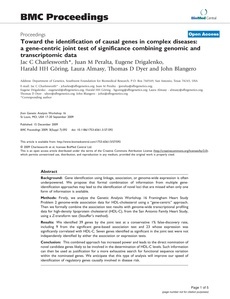 Such information can then be used as justification for a more exhaustive search for functional sequence variation within the nominated genes. We anticipate that this type of analysis will improve our speed of identification of regulatory genes causally involved in disease risk.